If you love curries, you will enjoy this home styled chicken curry. This curry is simply delicious when served over some steamed rice or roti. It's a little spicy with lots of chicken chunks, potatoes, and hard-boiled eggs. This simple curry is also an ideal one-pot meal to feed family or friends during any gathering. Combine the chili powder, turmeric, aniseed, coriander, cumin, pepper, and cinnamon. Remove 2 tablespoon of the curry powder and season the chicken chunks with a little sea salt. Add 6 tablespoons of water into the curry powder, mix well to form a paste. In a heavy pot, heat the oil and add the chopped yellow onion, together with the curry leaves. Cook until the onions are lightly brown in color. Add the curry paste, and cook until they are fragrant. Mix in the marinated chicken and cook for about 10 minutes or until the chicken is almost cooked. Add the coconut milk with 2 cups of water. Bring the curry sauce to a boil and then lower the heat and simmer for 10 to 15 minutes. Then, add the eggs and potatoes and cook for about 15 to 20 minutes. Season the curry with sea salt and serve warm or at room temperature. Yummy! This looks easy to whip up at home and definitely better than buying from the store! A mouth-watering dish. Great with bread or just plain rice. hats off chef! I usually cheat with ready made curry paste. thanks for the recipe, this lazy singaporean should get to work and cook from scratch more often! your dish looks amazing! I can make this with a few adaptations. Always handy to know how many persons the recipe is designed for though. This recipe can easily feed 8 persons. Wow, this looks so good. Saving this dish to make! Where is the Curry Powder in the recipe? I see 4 tbl Chili Powder and 3 Sprigs of Curry Leaves. Thanks. All the spice in the recipe is the curry powder. Is Chili Powder = cayenne powder? Cayenne pepper is less spicy compared to chili powder used in this recipe. I love the look and simplicity of the dish. I have all the ingredients in my larder, aside from the aniseed powder - but I reckon if I grind some fennel seeds that should work! Definitely one to try in 2013. The photo of that bowl of chicken curry really takes me back to the motherland, though I don't think I've ever had it with hardboiled eggs. I don't think I've ever seen aniseed powder in the shops here. Is there another suitable substitute for that ingredient? Fennel seeds might be a good substitute if you can't find aniseed. 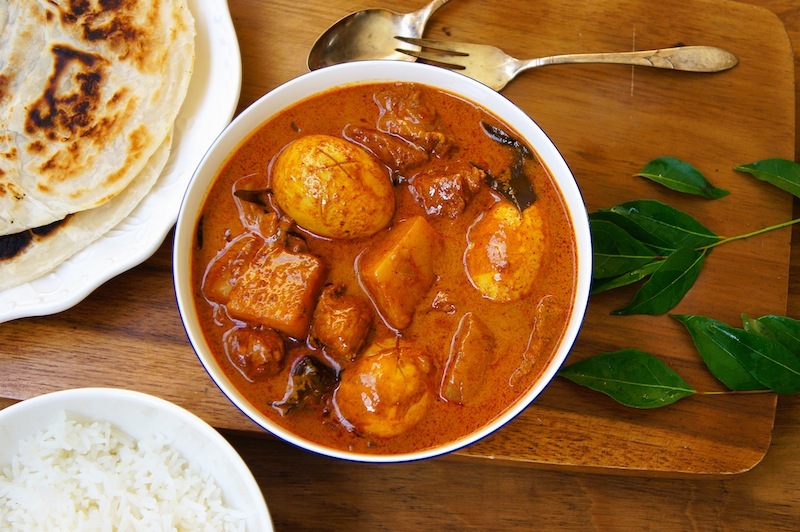 This chicken curry recipe is very delicious! It goes perfectly over some roti. This sounds wonderful. I love making my own curry.